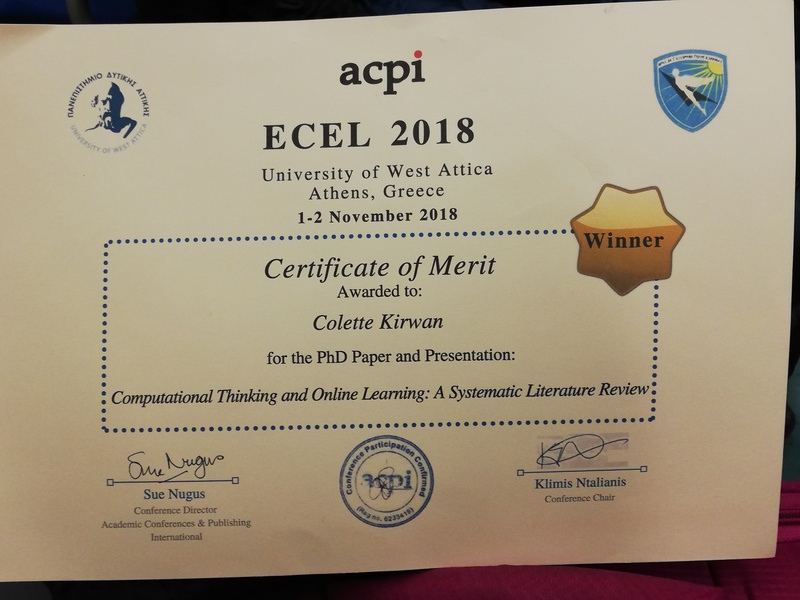 I have just returned from Athens where I had the privilege to present my current research at ECEL 2018, which is the European Conference of E-Learning. This was held at the University of West Attica, Athens Greece. To my utmost pleasure, I won the PhD paper and presentation award. Abstract: This paper introduces research concerned with investigating how Computational Thinking and online learning can be successfully married to help empower secondary teachers to teach this subject. To aid this research, a systematic literature review was undertaken to investigate what is currently known in the academic literature on where Computational Thinking and online learning intersect. This paper presents the findings of this systematic literature review. It outlines the methodology used and presents the current data available in the literature on how Computational Thinking is taught online. Using a systematic process eight hundred articles were initially identified and then subsequently narrowed down to forty papers. These papers were analysed to answer the following two questions: 1. What are the current pedagogical approaches to teaching Computational Thinking online? 2. What were the categories of online learning observed in the teaching of Computational Thinking? Our findings show that a wide range of pedagogical approaches are used to teach Computational Thinking online, with the constructivist theory of learning being the most popular. The tools used to teach Computational Thinking were also varied, video game design, playing video games, competitions, and unplugged activities, to name a few. A significant finding was the dependency between the tool used and the definition of the term Computational Thinking. Computational Thinking lacks consensus on a definition, and thus the definition stated in the literature changed depending on the tool. By considering a significant body of research up to the present, our findings contribute to teachers, researchers and policymakers understanding of how computational thinking may be taught online at the second level.